Jane Asher, 'Sweetly Does It' range from Kitchencraft, bring you this Mini Victoria Sandwich Kit. 1 x Silicone 12 hole baking mould, (dishwasher, microwave, oven and freezer safe). 1 x Reusable nylon icing bag, 36.5cm, (handwash only). Jane Asher, 'Sweetly Does It' range from Kitchencraft, bring you this Whoopie Pie Kit. Easily bake and decorate delicious whoopie pies with this 16 piece whoopie pie kit, complete with recipe booklet. JANE ASHER. MINI VICTORIA SANDWICH KIT. By Kitchen Craft. Set includes:-. 1 x palette knife. Roasting Tin Length x Width x Height: L-40.5cm x W-29cm x H-8cm. 2Lb Loaf Tin Length x Width x Height: L-24cm x W-15.2cm x H-6cm. Reclaim your kitchen space with this professional 7-piece stacking bakeware set. Break free from space confines with this 7-piece stackable bakeware set. 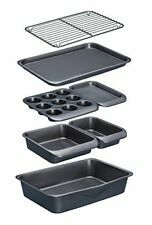 Every essential piece in one premium bundle: A roasting pan, square cake tin, loaf tin, muffin tray, two baking trays and a cooling rack. Masterclass Non-Stick Bakeware Set, 5 Piece. This Master Class Five-Piece Bakeware Set is perfect whether you're looking to upgrade your tired old bakeware, or you need a high performance kit to get you started. CAFE GOURMAND KIT. Create delicious café gourmand chocolates and cakes with this 6 piece kit complete with recipe leaflet. JANE ASHER. An easy to use cookery kit from Jane Asher. 1 x non stick silicone 8 hole spoon mould. Baking Dishes & Roasters. Baking Sheets & Trays. Size of Roasting Pan: 34cm x 26cm (13" x 10"). Jam & Chutney Making. Size of Baking Tray: 39cm x 27cm (15½" x 10½"). Table Mats & Trays. 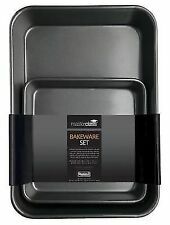 Masterc Class Bakeware 3 for 2. Baking Dishes & Roasters. Baking Sheets & Trays. Size of Roasting Pan: 39cm x 28cm (15½" x 11"). Jam & Chutney Making. Size of Square Baking Pan: 23cm (9"). Table Mats & Trays. 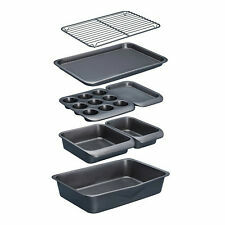 Masterc Class Bakeware 3 for 2. Excellent value. Great quality. This KitchenCraft cake tin set is the perfect way to boost your bakeware collection. Oven safe up to 220 degree celsius / 428 degree fahrenheit. Care Instructions : Handwash only1 x 22 cm (8½") springform cake tin. Brand New. Let’s Make. 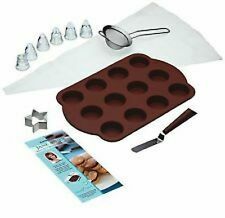 10 Piece Baking Set. Kids. Condition is New. Dispatched with Royal Mail 2nd Class. With a deep pie pan, spring form cake pan, loaf pan, baking tray and baking pan, this 5 piece bakeware set is the perfect choice for kick starting your Master Class bakeware collection. Kitchen Craft Master Class 5 Piece Non Stick Bakeware Set. It contains all the essentials you need, backed up by MasterClass’s exceptional quality standards. Each piece is made of heavy-gauge carbon steel, renowned for its strength, durability and heat distribution properties. KitchenCraft is the definitive kitchenware brand, with more than 1,300 everyday kitchen essentials to help you cook, bake and decorate. The tray?s non-stick too, so you won?t leave half of your dinner plastered to the surface when you serve, and washing up afterwards will be a doddle. (Of course, it?s also dishwasher safe, so you can really take it easy if you want to.) The magical crisping properties of this baking tray will deliver chips, veggies and other baked treats with real bite, every time you cook. The black tray has an open mesh surface, enabling moisture to escape and heat to circulate evenly around the food, so you won?t need to worry about turning it all the time. Excellent value. Great quality. This KitchenCraft cake tin set is the perfect way to boost your bakeware collection. Oven safe up to 220 degree celsius / 428 degree fahrenheit. Care Instructions : Handwash only. KitchenCraft MasterClass Smart Space Non Stick Carbon Steel Stackable Bakeware Set Including Roasting Tin, Baking Trays and Muffin Tray, 7 Piece Set. Masterclass smart space non-stick carbon steel stackable bakeware set (7 pieces). This Master Class Five-Piece Bakeware Set is perfect whether you're looking to upgrade your tired old bakeware, or you need a high performance kit to get you started. With its five premium products you can bake delicious cupcakes, sandwich sponges, loaves, shortbread, pies and lots more! Excellent value. Great quality. This KitchenCraft cake tin set is the perfect way to boost your bakeware collection. Oven safe up to 220 degree celsius / 428 degree fahrenheit. Care Instructions : Handwash only Box Contains 1 x 22 cm (8½") springform cake tin 1 x 24 cm (9½") springform cake tin 1 x 26 cm (10") springform cake tin.